2015 was the first year we celebrated Halloween with the children. To do so, we needed to find costumes which would be easy to make make and still please him (Gabriel) and be wearable (baby André). So we finally decided to make a spider costume for André and a bat costume for Gabriel. 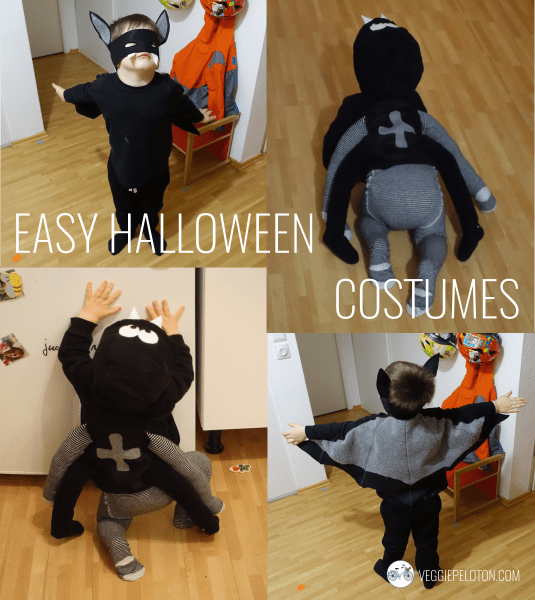 Almost everything we used to make the spider costume was bought at H&M, online (we find it easier to buy online when we look for something very specific and going to the store almost always means finding nothing of what we’re looking for! ): we used a black hoodie, 3 tights (they came in packs of black and grey-black stripes so we actually bought 2 packs) and a black baby bodysuit. We started by cutting 2 of the tights at the crotch level which we then filled with wadding so that they look like legs. To hide the place where we sewed them at the back of the hoodie we used an oval of felt with a grey cross on it, so that it looks like a cross spider. We positioned the legs so they have approximately the same distance between them and the arms (we though the baby’s arms and legs count as spider legs, so we needed 4 additional legs). To make the spider’s face we used white felt to make the eyes as well as two teeth. André was wearing black-grey striped tights so that the color of the legs alternated from black (the arms) to grey, black and again grey. We have chosen to do this so that the costume doesn’t look to dark and this is also the reason why we sewed a grey felt oval on his belly. The costume was very comfortable (André wore it for 4 hours without complaining and he could moved as usual). To make the bat costume we have also bought a black t-shirt and the pants online (it was amazingly difficult to find a simple black t-shirt with nothing printed on it!). We had adored this costume and we did almost the same for Gabriel. To make the mask we cut a stripe of black felt where we cut the eyes. For the ears we used black and grey felt which we have reinforced so that were stiffer. This however was not enough to hold the ears straight once they were sewed on the mask so we used a toothpick which we inserted between both felt layers and secured by sewing thoroughly with a zigzag stitch so that it doesn’t hurt when touching the skull (we also cut the toothpick ends so that they were not sharp). To make the wings we cut black felt with the wings shape and a smaller shape in grey. We sewed them together using black thread on the grey felt so that we could clearly see the seam (we though it made it look more real). Sewing the wings on the t-shirt was a bit tricky but at the end it worked out just fine! Gabriel was quite happy with his costume. Our first Halloween celebration was quite successful and we guess it will become a tradition. Next costume sewing: Carnaval!